We have created this Site Help Guide and Frequently Asked Questions section with the intention of hopefully addressing any questions and queries you may have and making it as uncomplicated as possible for you, the user, to find solutions. How does the new home page work? Let’s have a look at what we have starting from the top of the page…. Regular and past site visitors will recognise and remember the top of the page from the previous site version. This section functions exactly the same as the previous website design. There have been no changes here. Clicking on the donate button will take you to where you can choose to make a donation if you like and of course you can decide how much you would like to donate. 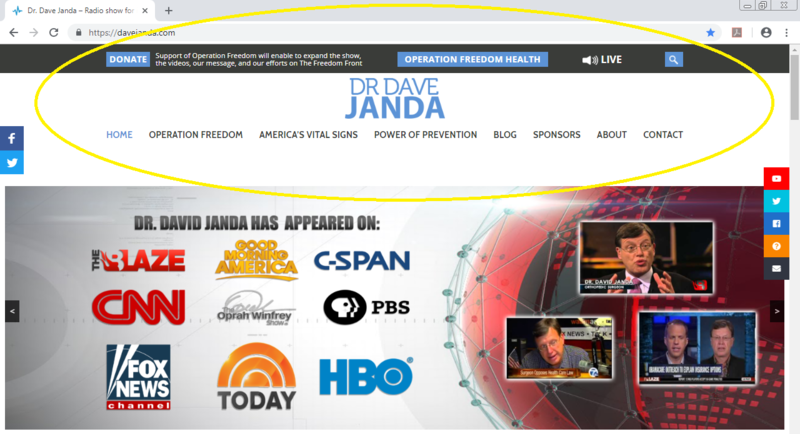 Clicking on the Operation Freedom Health button will take you to the Operation Freedom Health page of the Dave Janda site. Clicking on the LIVE button connects you to listen live. And of course clicking on any of the other options (Home, Operation Freedom, America’s Vital Signs, Power Of Prevention, etc, etc) will take you to that section of the site. On the left and right there are little buttons that will move up and down with the page as you scroll the page up and down. The Facebook and Twitter buttons on the left, when clicked, will share a link to the content you are currently viewing on that platform. 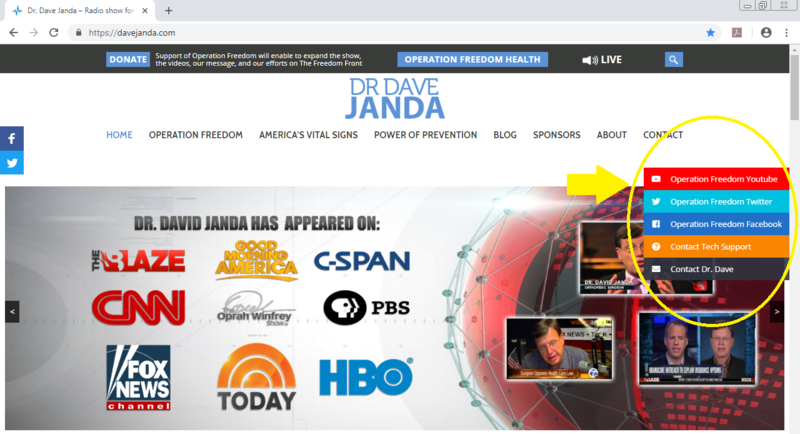 So for example, if you are watching a video on the Dave Janda website and you click the Facebook button on the left of the screen it will automatically post a link in your Facebook, as long as you are logged into Facebook. If you are not logged into Facebook it will come up with the Facebook log in page so that you can log into Facebook and share the link. The same process occurs for the Twitter button when it is clicked. The buttons on the right expand out when you move your mouse over them. These buttons will take you to their links when you click on them. These can be used at any time to visit Operation Freedom’s Youtube, Twitter, Facebook, to contact our tech support team or to contact Dr.Dave. The next menu option section is the cross bar section just below the advertisement slider. In this cross bar section there are 4 options. 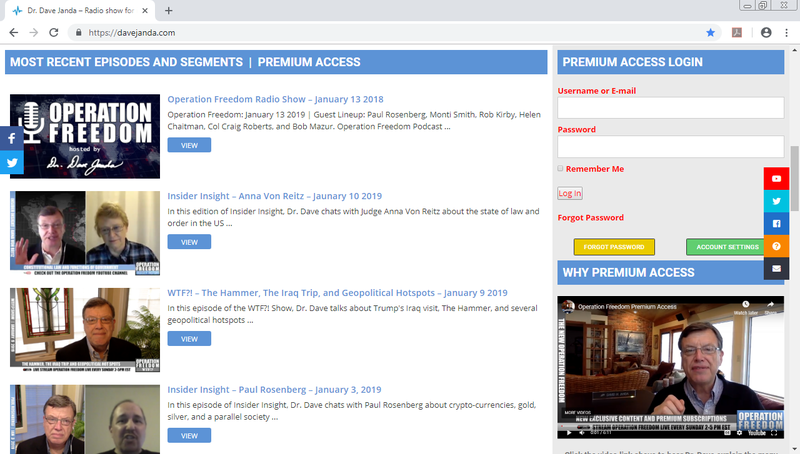 Donate to Operation Freedom, Latest Radio Show with a “Go to Podcast” button, Site Help Guide and FAQ and the last option on the cross bar section is the Premium Access with a “Subscribe Now!” button. Clicking on the Donate to Operation Freedom option will take you to where you can choose to make a donation if you like and of course you can decide how much you would like to donate. This donate button will take you to the same place as the donate button at the top of the page. We just included a second button to address some issues with regards to ease of locating a donate button. Clicking on the “Go to Podcast” button under Latest Radio Show will take you to the most recent Operation Freedom Radio Show. Here you can choose to listen to the entire show or just certain segments. Please remember you have to be a Premium Access subscriber and be logged in to view these. Clicking on the Site Help Guide and FAQ will bring you to here. Hopefully this guide will be able to answer any questions you have about the site. Clicking on the “Subscribe Now!” button under premium access will take you to the sign up form. On the sign up form you just fill out your details, ensuring you answer every question, create a password where it asks and click sign up. You are then asked to provide your credit card details for the subscription costs. 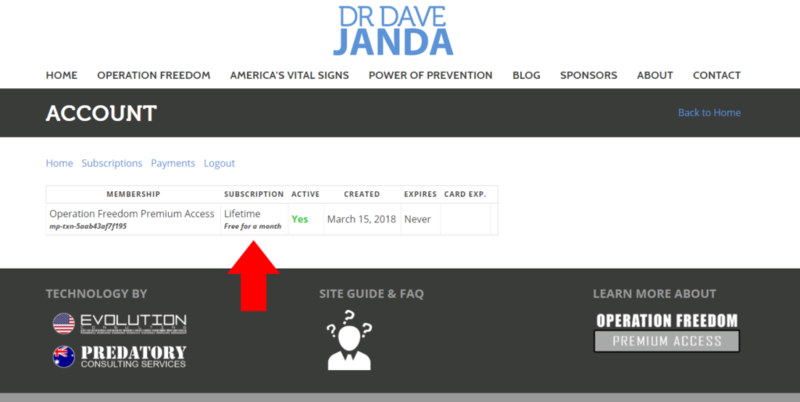 After entering the required details such as email address and user name, subscribers who have completed the payment process will receive a welcome email from davejanda.com. Just below this cross bar section menu is the Operation Freedom Exclusive Sponsors. Clicking on any of these sponsors will take you to their website. 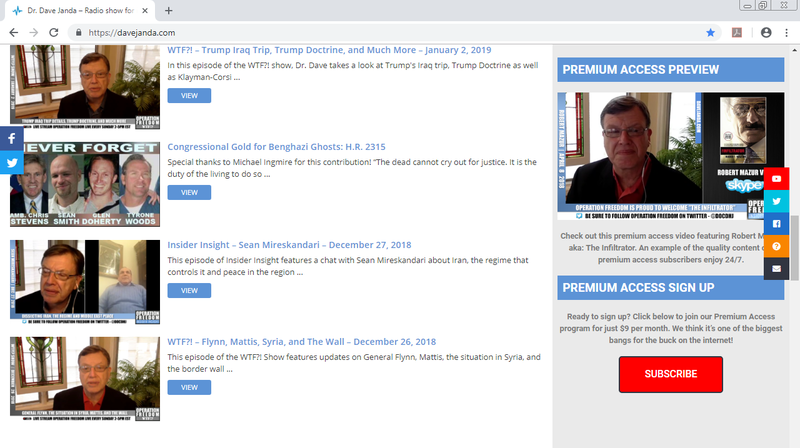 The next section down the page is the Most Recent Episodes and Segments on the left and the Premium Access Login in the right side section. Under the Most Recent Episodes and Segments section clicking on any of the videos or their corresponding view button will play that video. Please remember you have to be a Premium Access subscriber and be logged in to view these. To use the Premium Access Login in the right section just type in your email and your password in the correct boxes and then click the log in button. If you have forgotten your password please click the yellow “Forgot Password” button. Just type in the email address you signed up with and click the Request Password Reset button. You will then receive an email with easy to follow instructions and a link on how to reset your password. Follow these easy to follow instructions and click on the link. Then just follow the prompts to create a new password. Once logged in you can click on the account settings button to take you to your account settings. Here you can change the details you previously provided when you created your account and even change your password by clicking the change password option at the bottom and then following the prompts. To log out click the word Logout. This will appear in the Premium Access Login section after you have logged in. Underneath the Premium Access Login section on the right is the Why Premium Access section. In this video Dr. Dave himself explains the many benefits of being an Operation Freedom Premium Access Member. Beneath that is a Premium Access Preview video featuring Robert Mazur, aka: The Infiltrator. An example of the quality content our premium access subscribers enjoy 24/7. And below that is a Premium Access Sign Up section. Clicking on the “Subscribe” button will take you to the sign up form. The “Subscribe” button will take you to the same place as the “Subscribe Now!” button on the cross bar menu. We just included a second button to address some issues with regards to ease of locating a subscribe button for users who have viewed the videos in the Why Premium Access and the Premium Access Preview sections. On the sign up form you just fill out your details, ensuring you answer every question, create a password where it asks and click sign up. You are then asked to provide your credit card details for the subscription costs. As we continue down the home page we get to the Previous Episodes and Segments section on the left and the Stay Up to Date and In Memory Of sections on the right. In the Previous Episodes and Segments section you will find all the previous shows and episodes that are no longer in the Most Recent Episodes And Segments section. The content available in this section goes as far back as October 2010. Just click on the picture icon or the view archive button that corresponds with what you want to view. Please remember you have to be a Premium Access subscriber and be logged in to view these. In the Stay Up to Date section on the right you have the option of receiving an email the moment new content is available. Just provide your email address and click the sign up button and you will receive updates whenever new content is available. In the In Memory Of section listen to a tribute to the most courageous woman in radio, Linda Hughes. 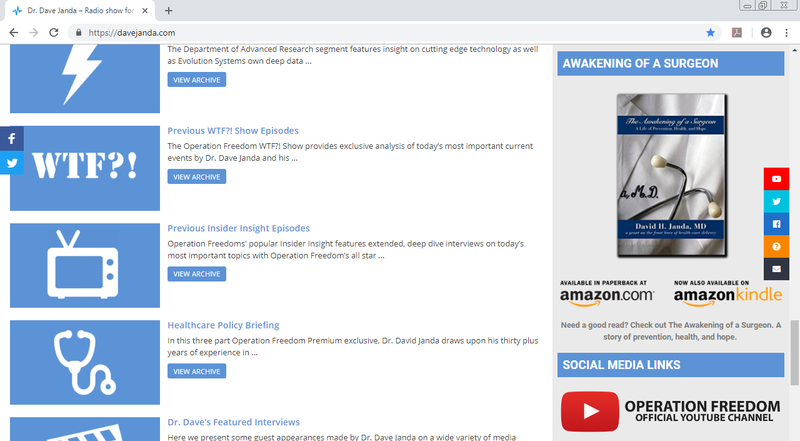 Further down the page we have more options for the Previous Episodes and Segments section on the left side and on the right there is the book “The Awakening of a Surgeon: A Life of Prevention, Health, and Hope.” Written by David H. Janda, MD. Clicking on the book will take you to Amazon and the options they provide for obtaining and reading the book. As we come to the end of the home page we can see on the right there are Social Media Links to the Operation Freedom Youtube channel, Facebook and Twitter. These links will take you to the same channels as the links in the floating buttons on the right of the screen. We included a second set of links to address some issues with regards to ease of locating the links. Along the bottom of the page there is the Technology by, Site Guide and FAQ and the Learn more about Operation Freedom Premium Access. Clicking on the company names under Technology by will take you to their website. Clicking on the Learn more about Operation Freedom Premium Access will take you to information about what Premium Access provides delivered by Dr. Dave himself in a video. How do I subscribe to Operation Freedom? To subscribe click on either of the subscribe buttons. One is on the right side just below the advertisement slider. The other is further down the page on the right side. Both subscribe buttons will do the same thing and take you to the same subscription form. We just included a second button to address some issues with regards to ease of locating a subscribe button. In the login section there is a yellow button marked “Forgot Password”. Clicking this will take you to a Request Password Reset section. Just type in the email address you signed up with and click the Request Password Reset button. You will then receive an email with easy to follow instructions and a link on how to reset your password. Follow these easy to follow instructions and click on the link. Then just follow the prompts to create a new password. Why can’t I login to Operation Freedom Premium Access even though I have signed up? This will occur if the email typed into the login box is incorrect or misspelt. Please make sure that the email address you are logging in with is the same as the one you signed up with. Operation Freedom access will only recognize the email that was used during the sign up / payment process. What do I do if pages are loading slowly and/or with missing content or not at all? If pages are loading slowly we suggest checking other internet usage activities. If you find that other internet activities are also running slower than normal then the issue is most likely a slow internet connection or slow mobile device connection. Unfortunately there is nothing we can do on our end to assist with this and we suggest you contact your internet service provider if the internet speed you are experiencing is unusually slow. If some Davejanda.com pages are not loading at all or it is only Davejanda.com that is running slowly after trying other internet usage activities then the issue may be coming from another program on your computer. It is possible that a setting on another program or software, for example McAfee, Norton Antivirus, Avast, etc, etc, may block some browser features in the interest of a security setting or feature. Unfortunately this can lead to preventing some browsers, for example Chrome, Firefox, Internet Explorer, etc, etc, from functioning as intended which may include issues with loading pages or some on page content. In this situation we suggest that you investigate these other programs and consider disabling restrictive settings in these other programs and see if this improves the speed and/or ability to load pages. What do I do if there is no audio while a video is playing? If the video is working correctly but there is no sound then please check that the volume on your computer is set to a high enough level. There will be an option within the computer settings to adjust volume. On a Windows system this will be in the bottom right corner and on a Mac OS it will be in the menu bar. The volume settings are most commonly seen as a speaker. Also please check the volume controller on the video / audio player window itself. The volume option is down the bottom of a video player window and on the right for an audio player window. 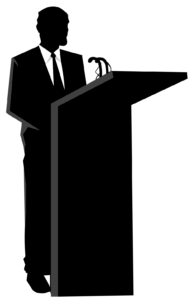 In both instances it will appear as a small speaker picture / icon. This is a volume setting specific to the video or audio that you are watching / listening to. Please check and ensure that it is not muted or that the volume is set to low. If after completing the above there is still no volume, then please check the actual computer and items plugged into the computer. (E.g. speakers, keyboards and monitor) The computer may have a physical volume knob on it and some attachments may have a volume control of their own that is affecting the volume output. Can I download content from Davejanda.com? Yes you can as long as you are a Premium Access subscriber and are logged in. 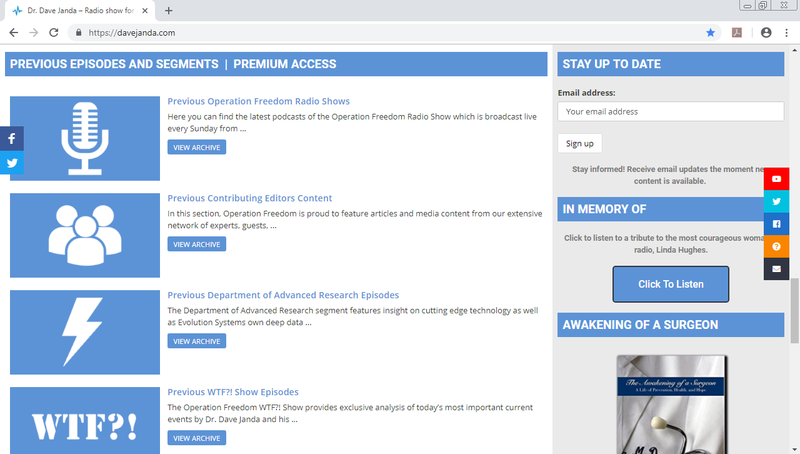 You can download audio files of any and all Operation Freedom Radio Shows from the most recent episode to all the way back to the first show in October 2010. You can also download audio files of the videos from other segments as well. To download content just click on the content that you want to download (Just like if you were wanting to view a video or listen to an audio). Once the content has loaded and started playing the options to download will also have appeared. To download an audio click on the 3 vertical dots just to the right of the player controls. Clicking the dots will make a download option appear. Click on the download button and downloading will begin. For video content a download button below the video will appear. Click on this download button and downloading will begin. Please remember that this will download audio only of the video selected. Video footage cannot be downloaded. Now you can take Dr. Dave with you on the go… even if you have no internet connection. 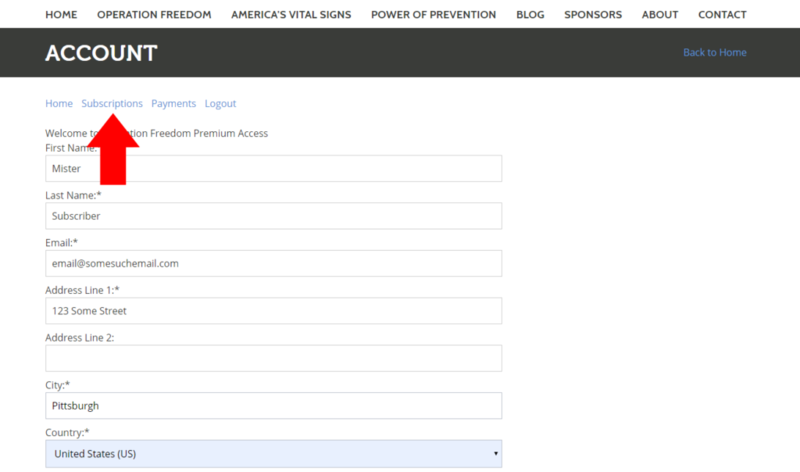 How Do I Modify My Operation Freedom Premium Access Subscription? Please note, that on the operation freedom home page [as pictured], there is the green button marked “ACCOUNT SETTINGS”. Clicking this button will bring current premium access subscribers to the account settings page. On the account settings homepage [as pictured], you will notice that in addition to your information provided upon sign up [name, address, email, etc], you will also see several tabs. Note the one with the red arrow marked SUBSCRIPTIONS. Clicking on that subscriptions tab will bring you to page which will show your active subscription to Operation Freedom Premium Access. PLEASE NOTE: THIS IS AN OPERATION FREEDOM DEMONSTRATION ACCOUNT ONLY. IN YOUR ACCOUNT THERE WILL BE TWO BUTTONS MARKED PAUSE AND CANCEL. THEIR FUNCTIONS ARE AS EACH LABEL INDICATES. In the example of our test account, [for demo purposes only] the subscription is marked “lifetime”. However, in your account you will notice that there will be two buttons. Cancel: will cancel your operation freedom premium access subscription. Pause: Will pause the Operation Freedom subscription at the beginning of the next billing cycle. This means that once your current billing cycle / subscription runs out, you will need to log back in and re-activate your subscription, thus beginning a new billing cycle of 9.00 USD per month immediately. Additionally, in this screen you can see the status of your Operation Freedom Premium Access subscription as denoted by the green YES under “ACTIVE”. Along with that, you will see other relevant information pertaining to your operation freedom premium access subscription. For additional questions regarding cancellation or pausing subscriptions, please contact the Operation Freedom Tech Team using the ORANGE QUESTION MARK ICON located on the right side of your screen / device. What do I do if I click on my Davejanda.com bookmark and some pages cannot be loaded? This is an issue that may occur when the Dr. Dave Janda website gets an update. Through the process of updating the website some of the website pages may have to be moved, deleted, renamed or re-created. This can cause bookmarks to sometimes lead to an old page and not work correctly because the bookmark connects to a page that may have undergone developmental changes. 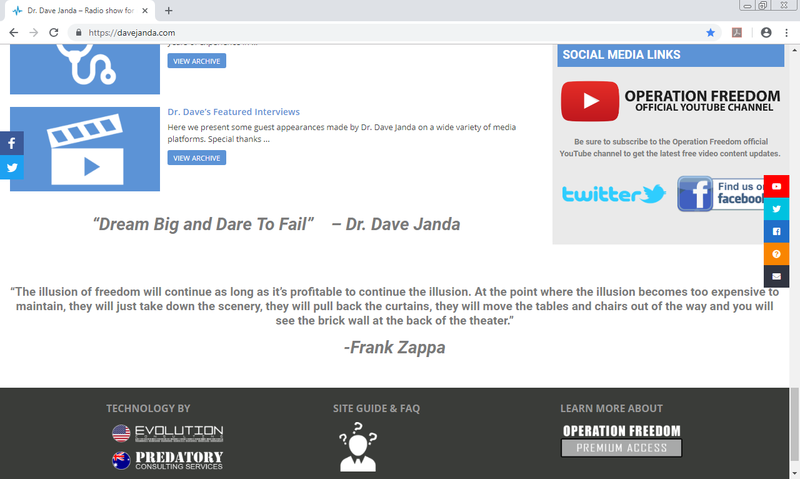 If you are experiencing this issue we recommend deleting the old bookmark, going to the Davejanda.com website via your internet search engine and then creating a new bookmark.